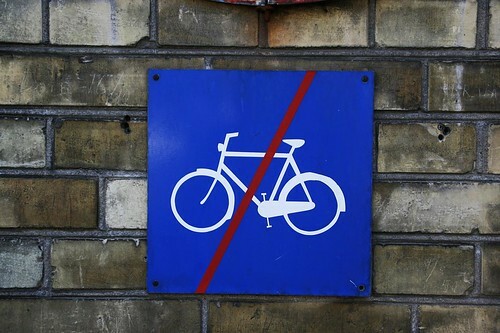 A country's bike culture is reflected in its bike signs. Fenders, chainguard, proper dynamo light. If the pictogram featured a 10 speed you'd think that no racing was allowed. But with this sign you're sure it means the general population. This sign is at the entrance to a hospital where ambulances arrive. You just have to walk your bike for five metres or so before hopping on again.